Initial impressions are good, although you may not immediately notice all the improvements as the 214ce DLX is very similar to the standard 214ce. The DLX features the same popular narrow-waisted Grand Auditorium body size that Taylor is known for, as well as a Venetian cutaway. The top is made of solid Sitka spruce, just like the original, although the back and sides feature laminated rosewood instead of laminated koa – our first major difference. The neck remains the same, with the classic easy-playing Taylor shape, made of sapele with a satin finish, an ebony fretboard and 20 frets. Tonewoods aside, it’s the smaller details that truly up the quality of the DLX. Additional appointments include small diamond inlays on the fretboard (instead of basic dots), a stunning glossy finish (instead of the satin of the standard 200 Series), and a simple but striking single-ring rosette. Note that the 214ce DLX is available in either a natural finish or a vintage-tinted sunburst – the latter of which coming in at an even higher cost (and, unless you are a big fan of sunburst, it doesn’t feel worth the extra cash). Overall, the aesthetics, ergonomics and build impress with this deluxe model. Most notably, the 214ce DLX features Taylor’s Expression System 2 electronics, with an advanced behind-the-saddle pickup and a small selection of controls on the top bout. It’s not the most versatile system out there – providing just volume, bass and treble rotary controls, all with no indication as to what they actually are. However, when you get used to it, you’ll find it’s a solid system for those wanting to plug in. Elsewhere, this guitar sports a set of Taylor’s own sealed nickel tuners, along with a NuBone nut, an ebony bridge, and a Micarta saddle. All quality additions, that enhance the reliability of this acoustic. It also comes shipped in a brown Taylor Deluxe Hardshell case, which is another upgrade compared to the softer case shipped with the standard 200 Series. You would have to be very picky to complain about the sound of this guitar – it’s excellent. Rich and warm, but well balanced. The spruce provides good articulation, while the rosewood – even though it’s laminated – offers the touch of darkness this tonewood is known for. The Grand Auditorium is usually a solid choice for an all-purpose guitar, and the 214ce DLX is no different – coping well with everything from country to rock, fingerstyle to strumming. The forward-shifted bracing offers a boost to the already generous projection, although the volume ceiling remains quite midrange – so heavy strummers and aggressive pickers will want to look towards a dreadnought instead. It’s a good-looking, easy-playing Taylor with a fantastic sound and solid electronics – what’s not to like? Even though most improvements over the original 214ce are aesthetic, there’s enough substance to justify spending the extra money on the DLX version – unless you already have a 214ce, then you may be better off saving for something in the 300 Series. 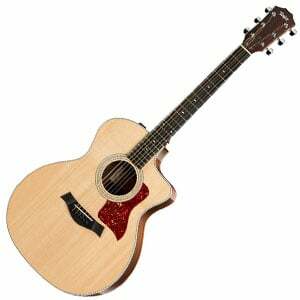 For more info about the Taylor 214ce DLX, click here. For more acoustic guitars under $1,500, click here.